Yang Myung (Jung Il Woo) looks at Yeon Woo (Han Ga In) and sacrifices for love, the “Yang Myung anxiety” if audience began. 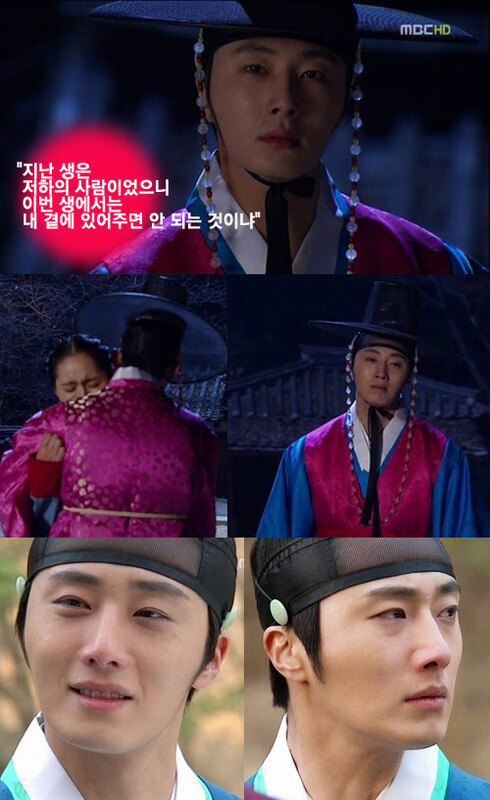 In episode 17 of The Moon Embracing the Sun broadcast on February 29th, 2012, Yang Myung who saw Yeon Woo and Hwon (Kim Soo Hyun) reunion is hit a blow. Then, the sudden attack by assassins to take the life of Yeon Woo, even though he is deeply hurt but he throws himself at the fight in order to save Yeon Woo. Yang Myung brings Yeon Woo to his mother Lady Park’s place. Yang Myung confesses coolly and sadly again to Yeon Woo, “You’re the only one I love in this world, couldn’t you be by my side for this life?” Arousing the sympathize of audience. Yang Myung is clear that his beloved woman in the situation of tragedy, because the other party is the king of a country, and this may be his last confession. Audiences said Yang Myung have brought heartache more than ever, expressing their pity. On the other hand, Hwon said solemnly that he wants to find out the relevant facts related to death of crown princess, Yang Myung is expected to go to the extreme in the remaining 3 episodes. The episode 18 with the subtitle of Bloody Precursor is aired on March 1st, 2012.